I wanted to recreate the old classic Gretsch HiLo'Tron® Pickup of the early '60s - That bright, single coil pickup in a standard Gretsch® 'No Ears' mount size just to get those great clear, rockabilly sounds with bite, with twang that really cut through the mix. A totally unique single coil sound with a little more mid-range due to the thinner coil wire and Tele-like twang due to the use of large internal ferrous plate. 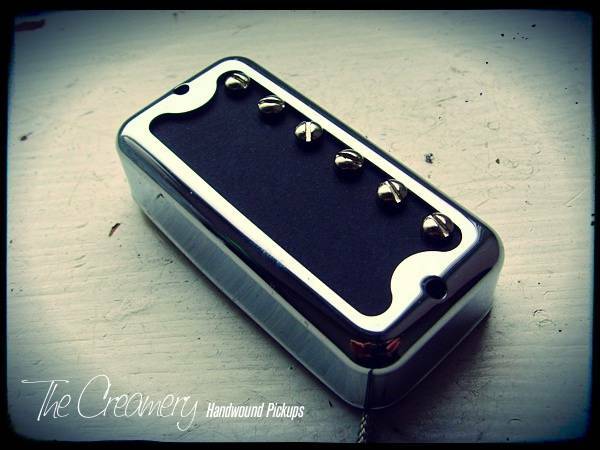 Crisp, clear with single coil definition its essentially 'half a Filtertron' design - one coil rather than two but with a thick bar magnet, sideways mounted to an angled steel plate that holds the coil and six adjustable plated steel pole piece screws. Although the Black Cat "HiLo" '60 is a single coil, it has its own unique sound, unlike the traditional Strat single coil pickup - It has more of the brittle bite of the Tele bridge with rockabilly twang mixed with a slightly sweeter high-frequency roll off, a little more mid-range than the output reading woudl suggest due to its use of thinner coil wire.